The Robshaws experience a thoroughly modern decade as they enter the 20s. They get a taste of the age's racy reputation as they host a jazz party with a menu of 14 cocktails. The Robshaw family are experienced time travellers, but this time they are going further back than they have ever been before - to the turn of the 20th century, to discover how the food we ate and the way we ate it helped shape the modern family. An ordinary house in south London is their time machine, transporting them through five decades and two world wars. Guided by presenters Giles Coren and social historian Polly Russell, they trace the incredible changes to Britain's diet and the extraordinary social transformation they reveal. 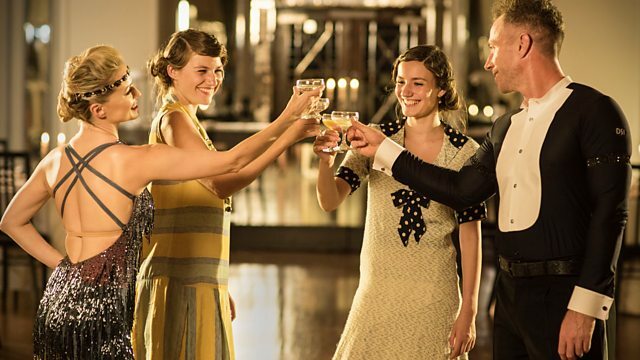 This time, the Robshaws experience a thoroughly modern decade as they enter the 1920s. They get their first taste of the racy reputation of the age as they host a jazz age party fuelled by a menu of 14 different cocktails. The decade has something new for everyone, with sweet treats for Fred, spicy food for Brandon in a 1920s curry house, and the kicks and tricks of the charleston for Miranda and Ros with Strictly's James and Ola Jordan. Rochelle has a new role too - as a modern housewife, no longer a lady of leisure, there is a lot of work to do in the kitchen now that Debbie has found new work in a grocers and a fish and chip shop. In this decade of rapid changes, corsets are gone, hemlines are raised and, at the dinner table, there are plenty of modern conveniences, with a completely tinned dinner, the wonder of Pyrex and the launch of some very familiar brands. Performer: Kenny Clarke. Performer: Thelonious Monk. Performer: Charlie Christian. Composer: Edgar Sampson. Performer: Harry “Sweets” Edison. Performer: Les Spann. Performer: Sam Jones. Performer: Jo Jones. Performer: Duke Ellington. Performer: Johnny Hodges. Singer: Ivie Anderson. Orchestra: Duke Ellington & His Orchestra. Families travel back in time to experience how food, leisure and society has transformed.